Bienvenidos a la clase de espanol! I am very enthused about teaching Spanish, geography, and culture to St. Joseph students. I am not a native Spanish speaker, but developed a fascination and love of the language and culture through an Air Force upbringing and travel at a young age. I’m so excited that my students have second language exposure in an immersion environment, at a very formative time in their language lives. I am a graduate of Benedictine College in Atchison, Kansas. I have a triple major in English, Spanish, and Education. I studied Spanish in Cuernavaca, Mexico through Benedictine and later did some graduate studies in Madrid, University of Complutence, Spain. 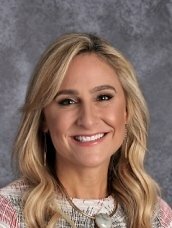 I have had unique teaching positions in the past, starting my career teaching at an all girls boarding school in Kansas. I held the position of Director of the ESL department and had the opportunity to travel throughout the year to recruit students internationally, using my bilingual abilities, for our short and long term English as a Second Language programs. It excites me to know that families internationally realize the benefit of a second language and the doors of opportunity that such an asset opens throughout one’s life. I live in Lisle with my husband and four sons. We enjoy traveling, cooking, caring for our pets (chinchilla, snake, dogs, cat) and attending many of their sporting events. I am an avid competitive tennis player, reader, am active in local politics, and coach my seven year old’s soccer team. I love teaching your children and am so happy to be a part of St. Joseph School.